The best part of Halloween isn't the costumes. It's the candy. I actually think having to come up with a costume is the worst part. But the candy is more than worth it. I know we probably won't get a lot of trick or treaters, but that doesn't stop me from buying bags on bags of candy. I try to think of creative uses for all the candy, but I just end up sprinkling it on cupcakes, stuffing it in cookies, or mindlessly eating twelve twix bars while watching SVU. Twix bars are my favorite. But a girl can only eat so much candy before she starts having nightmares about cavities. It was only logical to start putting candy in my drinks. I had everything I needed at the Lexington Cafe & Bar. Okay. 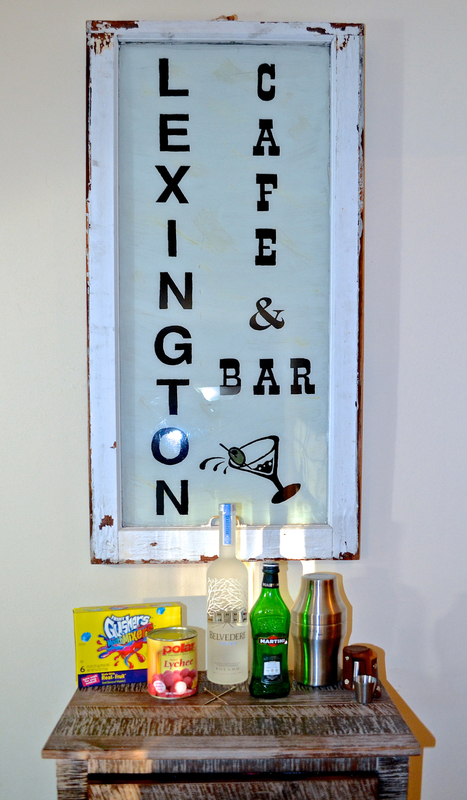 The Lexington Cafe & Bar is just the bar cart in my living room. But as soon as I figured out how liquor stores in Virginia worked, it became a pretty well stocked bar cart. I'm willing to argue that's it better stocked than some of the bars in town. What bar doesn't stock Ginger Beer. In 2015! AFTER the Moscow Mule and copper mug craze! No excuses. To make your martini, fill a shaker with ice, and add two part vodka and one part lychee juice. For one drink, I use two shots vodka and one shot juice from the can. if you want something stronger and not as sweet, you can use three shots vodka to one shot lychee juice. Give the shaker a good, virgorous shake unil it is cold and frosty. Pour a bit of vermouth into your glass. Swirl it around so the vermouth coats the inside of the glass and pour out the excess. Strain your lychee martini into the glass. To make your spooky lychee eye balls, stuff one gummy in the center of each lychees. 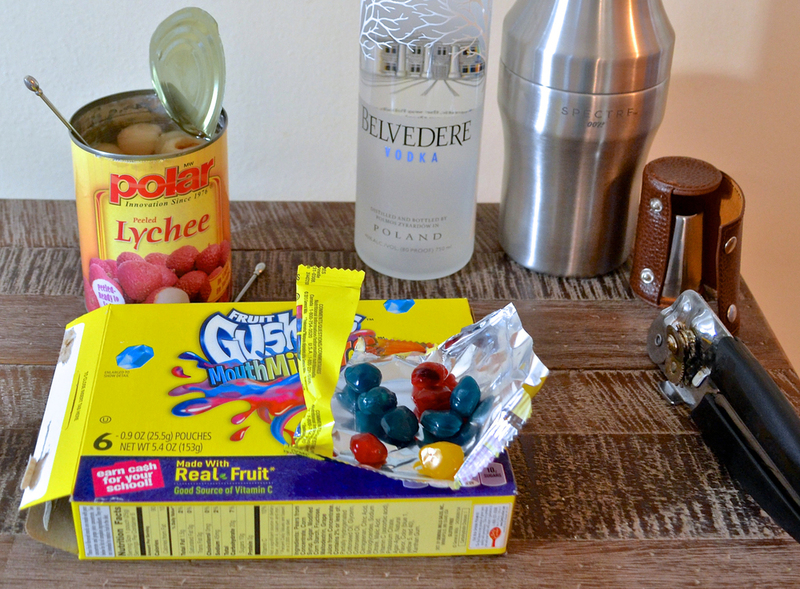 Blueberries also work well in place of gummies. Poke a cocktail stirrer through the your lychee eyes and sit the stirrer on the rim of your glass. You can also just drop the eyes into your drink. 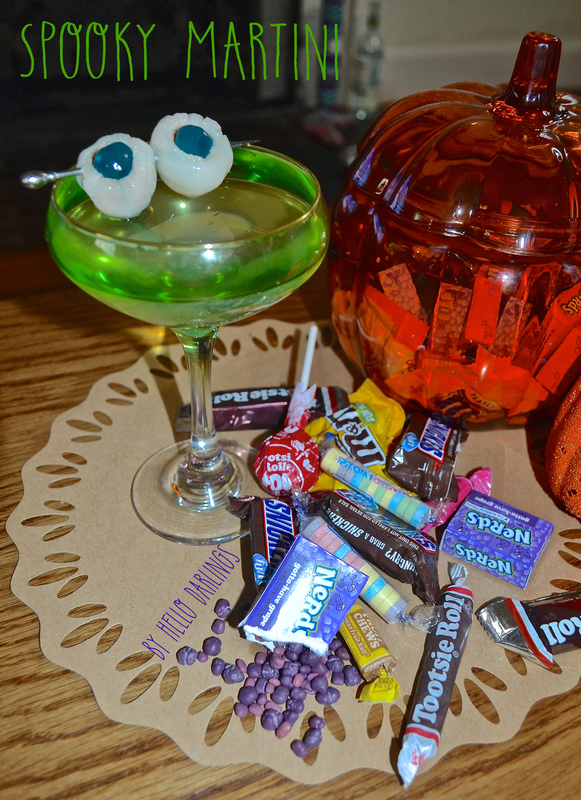 Enjoy your delicious adult beverage responsibly and eat the eyeballs when you're tired of your drink staring back at you.